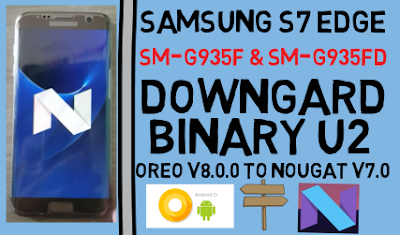 How To Samsung S7 Egde (SM G935F & SM-G935FD)Binary U2 Downgrade Oreo V8.0.0 To Nougat V7.0. Samsung S7 Edge Downgarde Required File. 3# Download S7 Edge SM-G935F Nougat V7.0 Stock Rom. 4# Download S7 Edge SM-G935FD Nougat V7.0 Stock Rom. Note: Support For Binary U2 Only. Samsung S7 Edge Downgarde Method. 1# Download all file extrack. 4# Selcet AP,CP,CSC,BL file on odin. 6# Now your phone downgarde process show. 7# Your phone show brick. 8# Now open softbrick tool. 9# Open your phone on download mode. 10# Click softbrick tool like video. 11# Now your phone show some time logo. 12# Open recovery (Click volume up ,power and home buution). 13# Now your phone open recovery and click wipe data. 14# Now your phone open normal mode. 15# Your phone alive nougat v7.0.